Doctor Congo, I Presume? | SPACE-BIFF! Government interests hinge on the prosperity of Kinshasa and the nearby port. 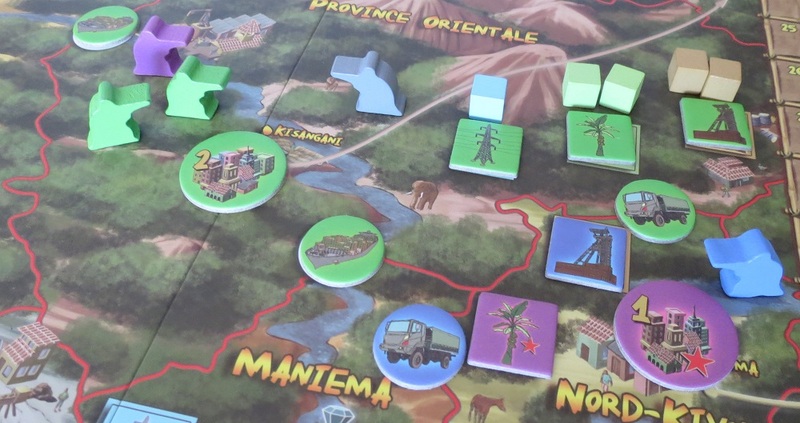 With a topic as debatable as “ultra-rich tycoons use their money to save the Congo,” it would be easy to assume that the gameplay has been given the short end of the stick. Instead, it’s a pleasant surprise that everything happening on the board actually supports the concept. The rulebook tries to introduce itself over the course of four stages of increasing difficulty, but it’s the full game I’m interested in, handing everyone a role that bestows a starting province and a stack of cash. From there, it’s time to roll up your sleeves and get to work. There are five major levels to DRCongo’s economic simulation. Each of these are simple enough on their own, but as they interact (and as other troubles multiply), a monstrously involved dynamic is given life, and players must wrestle against the constantly evolving board state. First up are industries, the resource-makers that are the source of all wealth. Put simply, you spend money to found an industry, whether agriculture, electric, mining, or oil. These will sit dormant until someone decides to spend a turn producing, at which point little blocks of resources will pepper the map. It isn’t enough to simply accumulate raw materials, however. In order to transform them into profit, they must first be sold. This is usually done by exporting them, either via the sea to the west or overland to the east, and so you build ships, trains, and truck routes to haul your materials. And then there are cities, pricey seats of power that buy electricity and help cement your authority over a region. These are also, incidentally, one of the most reliable ways to earn “medals,” DRCongo’s version of victory points. Now, on their own, these interlocking elements are already tricky enough to manage. The most profitable exports are done by tracing a line to the port, trucks limit how many resources you can haul at a time, and industries can be exhausted to decrease the cost of building or improving cities. Within the first two or three rounds, the board becomes a mess of competing industries, transport lines, and unsold resource cubes. Without direct means of attacking your rivals, much of the game revolves around swooping in and nabbing limited industry or city slots before your competitors can, locking them out of profitable spots. And then there are the political offices whose buttoned leather chairs you can bribe your bottom into, letting you adjust export prices or even control the government’s development efforts directly in exchange for a tidy consultation fee. In short, it’s tricky stuff. And that’s before the insurgents show up. Insurgents show up every round, disrupting every single piece of the puzzle listed above. They make construction impossible, kill peacekeepers, and make off with stacks of resources if they manage to get the upper hand. Even when you manage to position your troops so as to keep them suppressed, they raise enough trouble to slow down production and harass export routes. And their appearance is regular and unrelenting. Of course, there are solutions. Peacekeepers are expensive, limited, not guaranteed to work, but necessary regardless. Cities and their internal police forces are naturals at suppression, though they can’t act on their own. And if things get dire, it might be a good idea to “request” (buy) the defense ministry’s access to the army. In any case, the economic simulation of DRCongo demands constant vigilance against these threats, and sometimes the appearance of insurgents can even be useful. Wiping out a particularly well-funded group, for instance, lets you take possession of their diamonds, which can be sold for pocket change or hoarded to buy more medals. And, of course, sometimes they appear in a competitor’s unprotected province. Insurgents keep everyone on their toes. Regions that previously felt secure can become suddenly and violently unstable when a strong group of insurgents appears and wipes out the peacekeepers stationed there. Without the threat of uprising, the game’s economic portion, involved as it is, would be far too stable to make for good gameplay. On the thematic side, insurgents also represent one of DRCongo’s more controversial inclusions. As industrialists, players are not only tasked with the suppression and eradication of these faceless insurgents, but also with the same sort of actions that have given rise to mass protests and, yes, various anti-government insurgencies over the years. By engaging in diamond trafficking and the purchase of political offices, the game suffers some degree of disconnect between its benevolent nation-building heart and its get-rich-quick brain. At times, its hypothesis not only seems hopelessly optimistic, but even hopelessly naïve. As the game progresses, the economic portion grows ever more complex. However, I’m not quite willing to call this a failure on DRCongo’s part. In one recent game, I was struggling to acquire mining rights in the southeastern portion of the country, racing against two competitors for the mines and easy export routes of Katanga. The city infrastructure of Lubumbashi was nonexistent, transport was flimsy, and insurgencies were cropping up again and again, driving us out as soon as we got a toehold. The situation was dire. But then something happened. One of my competitors had a proposal for us, a way forward that would let us divide the industries of Katanga if we could just cooperate for a single, maybe two turns. If we all sent in peacekeepers, dividing the cost of suppression, and had the player who was in control of the defense ministry deploy the army to assist, we could make construction safe, even if only for a short time. We could then each have a slice of the pie. Later, he promised that he would reposition his forces to give everyone a foothold in Kasai as well. There would be industries and cities enough for everyone. Naturally, we were mutually suspicious. Someone would nab the industries for themselves, we reasoned. Someone would improve two cities rather than only taking their share. But as we set our peacekeepers in Katanga, someone made an observation that transformed my outlook. Without thinking about it, we had all positioned our forces on the same side, little meeple guns pointed the same direction, us against the insurgents. We may have been opponents, competitors, but we were not enemies. Hopelessly optimistic it may be, and perhaps somewhat naïve too, but DRCongo argues that our best way forward is inherently cooperative. More importantly, it doesn’t argue for a utopian change of heart or that we all have to be on the same side, but rather for a quiet and steadfast determination to improve the world around us. It argues that we can serve ourselves and serve others at the same time. Impossible? Maybe. Maybe not. Who’s to say? At least DRCongo makes the case for giving it a shot. For that reason alone, it’s worth the effort. Posted on November 1, 2015, in Board Game and tagged Board Games, DRCongo, Ragnar Brothers, The Fruits of Kickstarter, Why Games Matter. Bookmark the permalink. 3 Comments. I know it’s more realistic to assume humanity will evolve and grow this way, but the optimist in me is still holding out for Gene Roddenberry’s socialist-esque Utopia. Well, that was fantastic. Seems like there have been a lot of very good and even thinky pieces on SB! lately! I’ll be looking into this.